Golf cart batteries is one of the biggest investments you'll make as an electric golf cart owner. I spent $700 several months ago for six 8 volt batteries and I don't want to replace them any time soon. I am sure you are just as interested as I am in extending the life of your deep cycle batteries so that many years go by before they need to be replaced again. Find out from Terry Felner from Thermoil.com his top tips for golf cart battery maintenance and additives that can not only increase battery life, but prevent corrosion, reduce water consumption and toxic fumes. 1. 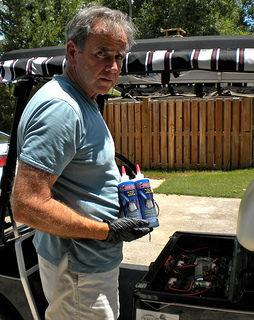 All golf cart owners are interested in extending the life of their deep cycle batteries. What is the top tip you have to prevent premature death of golf cart batteries? There are really three top tips. 1. Charge your golf cart batteries after each use. 2. Never run the fluid level low below the plates. 3. Prevent corrosion from forming on the battery post and all the connections. Your battery should never be discharged more than 70% of its rated reserve capacity, because the longer a battery takes to recharge, the more heat it creates. Heat destroys batteries, which is why batteries need to be replaced more frequently in warmer states than colder states like Wisconsin.Think of it this way. You have to identical cars and each one goes 120mph. If you ran one engine at top speed all the time 120 mph and the other at half speed 60 mph the engine running at half speed would last 2 to 3 times longer because the engine is not running as hot, heating the rings & pistons up, breaking the engine oil down much sooner etc. A battery is something like this. If you run it till it is dead each time that is like running the car engine wide open at the 120 mph which creates much more heat. This is why batteries like in AZ last one third as long as batteries here in WI. Heat destroys batteries and the more you discharge the battery the longer it takes to charge which in turn creates more heat. The more heat the more paste you wear off the plates. What's The Best Electric Golf Cart Battery? 2. What golf cart battery makes do you recommend for the longest battery life? 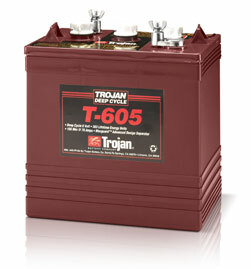 Trojan makes one of the best deep cycle batteries in the market place. You get what you pay for. People think a battery is a battery but they could not be more dead wrong. Think of it this way. Lets go back to the engines again. Say that you and a friend are retired and you both have a big travel trailer that your going to pull and travel the country the rest of your life. You each buy two identical pickup trucks to pull these campers. You get a diesel engine and your friend gets a gas engine. We all know that the diesel engine will last much much longer but it cost more. Batteries are something like this. You can buy a cheap one which will have less lead, less plates etc or you can buy a good one which will have more lead, thicker plates etc. Now if you do not take care of your batteries, don't charge or water them on time etc then you might as well buy the cheap batteries because the good ones would not last long either but if you maintain them properly then the good ones will last you much longer. Like stated above you get what you pay for. 3. Give a brief explanation of sulfation and how it affects golf cart batteries. Sulfation is when the sulfur in the sulfuric acid forms and starts to crystallize on the lead plates. The electrolyte in a battery is basically 35% pure sulfuric acid and 65% pure distilled water. Think of it this way. When you are running your golf cart or discharging your battery this 35% acid starts to enter the plates in the battery which in turn creates energy. If you ran your battery flat dead all this sulfuric acid would be in the plates. That is why if you did a hydrometer test then it would show your battery completely dead because the only fluid that would be in the hydrometer would be the 65% pure distilled water. The 35% pure acid is inside the plates. Then you put the battery charger on and the charger drives this acid back out of the plates to mix with the distilled water. When all the acid is driven back out then your battery is fully charged. So the acid goes in and out and in and out and slowly starts to wear some of the paste off the plates. When all the paste is worn off the plates you got the full life of the battery. Now if you discharge your battery or your battery sits idle for periods of time this acid is in the plates and if you do not charge it to drive the acid back out of the plates sulfation will start to form. Picture sulfation as a concrete crust that forms on the outside of the plates. The longer it sits without being charged the harder this concrete crust gets. Now you realize that you have not charged your batteries in a timely matter and you put the charger on to drive the acid out of the plates but the acid cannot get out because it cannot break through this concrete crust that has formed on the outside of the plates and your battery then starves to death. 4. 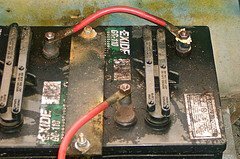 What golf cart battery maintenance tips do you have to prevent sulfation? 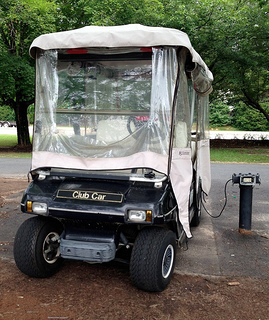 Always charge after each use as soon as possible and if your golf cart is going to sit idle for periods of time, charge them every month or so. An electric golf cart battery needs even more frequent charging in hot climates because the hotter the climate the more a battery self-discharges everyday without even being used. 5. Tell us about your two main products, Battery De-Sulfater and Battery De-Mister. 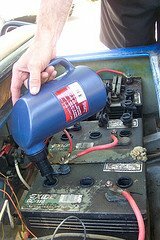 Battery De-Mister® is a patented oil that will always float on top of the electrolyte and will eliminate all corrosion, greatly reduce water consumption, toxic fumes and the risk of explosion. When you have no corrosion anywhere whatsoever your battery will then charge up quicker (which not only saves you money on electricity) but the quicker your battery charges the less internal heat and the less internal heat the less paste that is worn off the plates. If you run your battery low on water and the plates were to get exposed to the air you have just destroyed that part of the plate which results in loss battery capacity. With the De-Mister® in the battery it would take much longer for the water levels to get low and if the oil were to get into the plates it would damage the plates about 2% but it would protect the plates from drying out because it would coat that part of the plate. You add water, charge and the oil will float back to the top of the electrolyte. Battery De-Mister® will not give the battery any more life cycles but 95% of golf cart batteries do not come close to living to there full life. With Battery De-Mister® you will get the full life out of your batteries which in many cases is 2 to 3 times longer. Battery De-Sulfater is the companion product to Battery De-Mister®. Battery De-Sulfater will reduce battery failure, keep PbO2 spongy and soft, increase power efficiency, limit internal heating, help to prevent damage from overcharging and will restore mechanically sound sulfated batteries. 6. 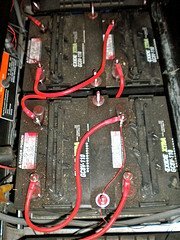 Should all electric golf cart owners use battery de-sulfater or battery de-mister even if they do regular golf cart maintenance? Do they need both products? How often and when should they be used? Battery De-Mister® should be added to all new batteries to get the full life out of your batteries. When you get corrosion that is from the acid loss that comes out the top of the battery cells while under charge. With De-Mister added to the battery you will never have any acid loss which in turn eliminates all corrosion while keeping the battery chemistry the same. By always having the right electrolyte chemistry your battery will perform better and charge up faster which means less internal heat thus less paste being shed off the plates giving you the longest possible life out of your battery. You only need Battery De-Sulfater if your battery has sulfation. You can add Battery De-Sulfater to new batteries to help prevent sulfation but if you charge your batteries after each use and never let them sit idle for periods of time without being charged you would never get sulfation but if you have sulfation then Battery De-Sulfater is for you. Battery De-Sulfater will break up sulfation, eliminate resistance by up to 50% and will restore mechanically sound sulfated batteries. There is nothing that works better, faster and easier than Battery De-Sulfater. Don't discard a sulfated battery, rejuvenate it. Bring your battery back to life with Battery De-Sulfater. And like Battery De-Mister®, Battery De-Sulfater is guaranteed 100%. Each product is good for the life of the battery and only needs to be added once. Battery De-Mister® should be added to a new battery or fairly new battery to get the full benefits and longest life from the battery. Battery De-Sulfater really only needs to be added if you have sulfation already. 7. How can one order your products? You can order both products by going to www.Thermoil.com or call 800-221-5351 to find a distributor in your area. 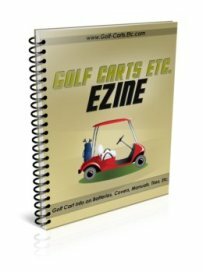 This is great information for all of you electric golf cart owners - longer battery life, less corrosion, and reduced water use and toxic fumes. What's not to like about these additives? Having just purchased a refurbished golf cart 4 months ago with new batteries, I am anxious to start using these products in my golf cart batteries.